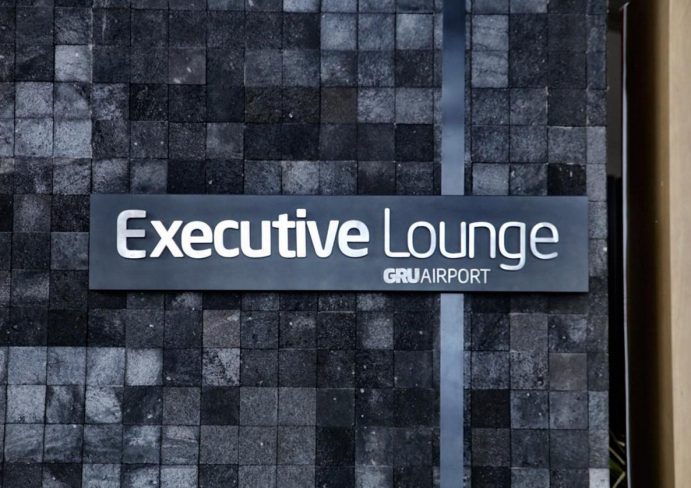 In a period of two short weeks, on my 92,000 mile mileage run, I visited the GRU airport 4 times, and spent a total of 60+ hours exploring ALL of the GRU lounges in the airport. Thanks to my Priority Pass and One World Emerald status , I was able to gain access to every lounge in the airport. Also, since I was there for a combined time of over 60 hours, I had plenty of time to fully experience each lounge. I ate breakfast, lunch, and dinner in lounges, and even slept in one of them. 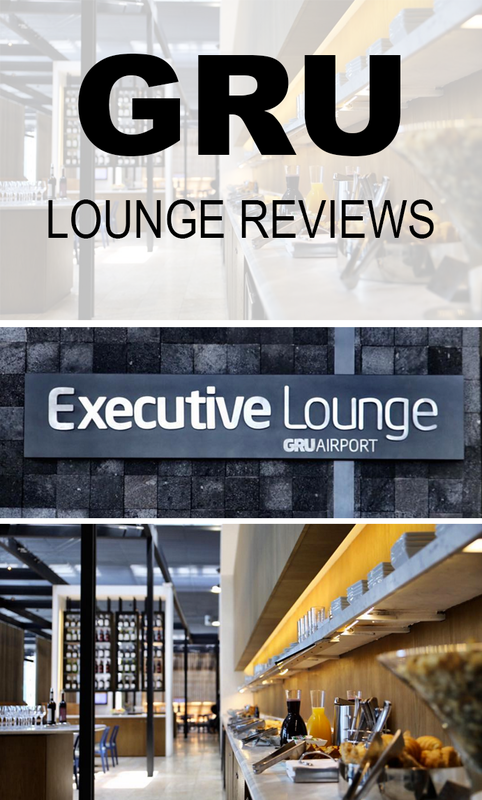 If you have a long layover in GRU, I hope the reviews below will help you decide where to spend your valuable lounge time! Before I jump into the reviews, I want to give you a quick layout of the airport. The majority of international flights will transit through terminal 3. This is the new and MUCH nicer international terminal. If you’re flying anywhere outside of South America, this is where you’ll be spending your time. If you’re connecting to an international flight to another South American country, I’m sorry to tell you that you’re flight will most likely be leaving from the MUCH older terminal 2. There are two lounges in terminal 2, and I was not impressed by either one. However, if you have a long layover, there’s no reason that you can’t visit a lounge in terminal 3 and then make the 15+ min walk to your boarding gate in terminal 2. This would be my recommendation, if you can spare the time. These lounges are listed in order from best to worst (IMHO). If you have a layover GRU, and you have access to the LATAM VIP lounge, spend you time there!! Hours: 5:00 a.m. – 12:00 a.m. Location: This lounge is located on the second floor of terminal 3. Walk past the Starbucks about 50 yards and take the escalator to the second floor. The LATAM Lounge will be the first lounge on your left. Access Options: The LATAM lounge is combination lounge shared between LAN and TAM Airlines. Both of these are South American Airlines so I’m not very familiar with their frequent flyer programs. I’m sure at some point if you have high enough status on either of these airlines, you can access the lounge. I was able to access the lounge because of my One World Ruby status combined with the fact that I had a departing flight on a One World carrier. In order to access One World lounges using your One World Status; you must have a departing on a One World carrier. Unfortunately, you cannot access this lounge with the Priority Pass. Atmosphere: This lounge by far has the best atmosphere! One wall of the lounge is covered in the glass, and you can see out onto the runway! I love lounges where I can watch planes take off and land! I was at this lounge for about 10 hours one day, and it never got crowded. In comparison to the other lounges that are accessible with the priority pass, this was huge perk. Additionally, this lounge is HUGE. So ever if there were a lot of people, I’m sure you’d have no problem find your own private space. This lounge felt the nicest. There was huge wine rack in the middle of the lounge that made it feel super fancy, plus all of the wine was displayed very nicely. You could tell that they put a lot of effort into the details. Food Options: It was a close competition for first between the LATAM Lounge and the Star Alliance Lounge for the best food options. However, the LATAM Lounge takes the prize for best food because of their multiple cheesy bread options, and their ridiculously good soup! Also, this was the only lounge that made their sandwiches with croissant bread! Seriously, it’s hard to make anything taste bad when it’s stuck between two halves of a croissant. Plus, they had plenty of salad toppings, and few well-plated and delicious desserts. Make sure to try the mini fudge pies. Drink Options: I honestly don’t know if the drink options here were the best, or if they just did a better job displaying. Either way, this was by far the most tempted I was to have a glass of wine. If wine isn’t your thing, they also have self-pour bar, and plenty of water and coke products. My only complaint is that they didn’t have soda water, and I’m kind of addicted. WIFI: This was my BIGGEST complaint about this lounge. For some reason I kept getting kicked off the WIFI, and their log-in screen made it really hard to reconnect. If you do get kicked off the wifi, try reconnecting and visiting a site that you’ve never visited while connected to their wifi. For some reason this worked for me. Showers: I took one shower here, and I wish I could have taken more! The showers were clean, they gave you way too many towels, and it was the only bathroom that gave you hotel sized toiletries. Plus, they give you a comb, which I had forgotten! Location: This lounge is located on the second floor of Terminal 3. Walk past the Starbucks about 50 yards and take the escalator to the second floor. Then walk past the LATAM lounge and the Admirals Club will be on your right. Atmosphere: I found the staff in the Admirals Lounge much friendlier than any other lounge I visited. Even before I had my Executive Platinum status, they went of their way to help me. Access Options: Thanks my One World Ruby status and the fact that I was flying business class, I had access to the Admirals Club. You could also access the Admirals Club if you pay $450 a year for the Admiral Club’s yearly membership, or if you have the American Airlines Executive Card from Citi Bank. 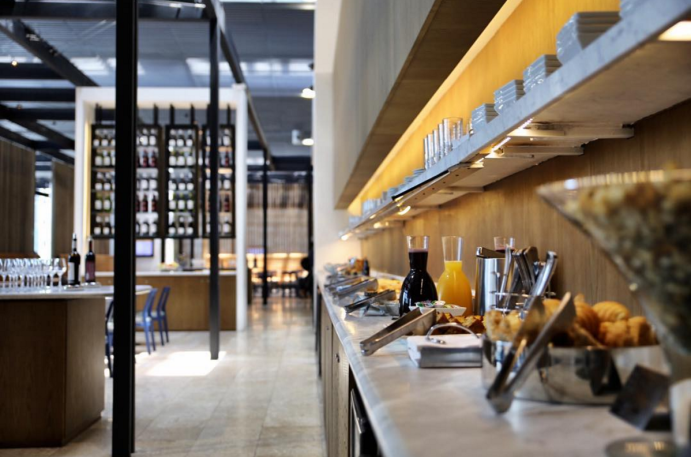 Food Options: The Admirals Club ranks third in food options, behind the Star Alliance Lounge and LATAM Lounge . Unfortunately, none of the lounge food in GRU is overly impressive, but can put together a satisfying dinner with what they have the Admirals Club. My favorite was this creamy chicken corn stuff. It went great over the rice! You can also build you own salad, and pick from a few fancy looking, but less impressive tasting dessert options. Drink Options: Like most of the other lounges in the GRU, the Admirals Club has a self-pour bar consisting of wine, champagne, and a few liquors. Their bar seemed to be on par with most of the other lounges. Wifi: The WIFI in the Admirals Lounge was the best I found in the airport. It had an extremely strong signal, and I could even pick it up outside of the lounge. I ended up using the Admirals Club’s WIFI from a different lounge because it was better the lounge I was currently visiting. Accessing the WIFI was easy, they have passwords on little signs all around the lounge. Showers: I took advantage of the showers in the Admirals Lounge multiple times. They showers were clean, spacious, and very nice. My only complaint is that I had to wait for close to an hour every time I wanted to shower. Hours: 12 p.m. to 3 a.m. This is the last lounge to open in terminal 3, but it also stays open the latest. Location: Right beside Starbucks, you’ll see a big twirling walkway that lead to the second floor. Go up the walkway, take a left, and keep walking into you run into the lounge. 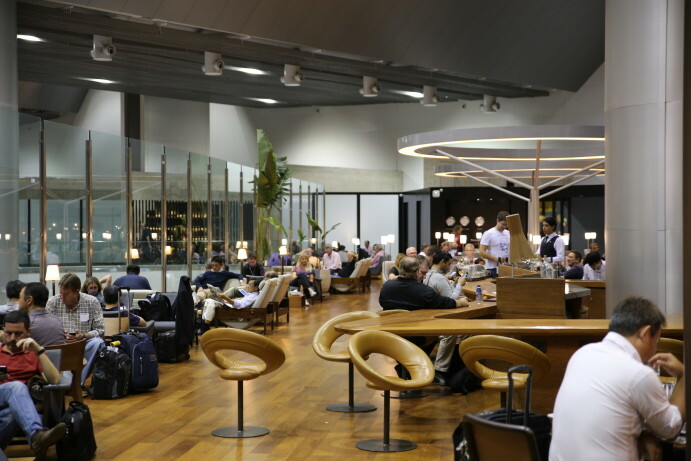 Access Options: I’m sure you can access this lounge with Star Alliance status, or if you’re flying business class on any Star Alliance airline. I was able to access the lounge using my Priority Pass. Lucky for me (and possibly you), you don’t even have to be on a Star Alliance flight. You just need to have boarding pass for an upcoming flight. Atmosphere: The atmosphere at this lounge ranks second behind the LATAM lounge. Similar to the LATAM lounge, one of the walls is glass and you can look down at all of the poor people who don’t have lounge access ☺. The lounge is very open and spacious. The only problem is that it was PACKED every time I visited. I believe this is due to the large number of Star Alliance flights that transit through GRU, and the fact that it’s the best lounge option for Priority Pass users. Food Options: The food in this lounge was great! You can easily fill up on dinner, even if it’s just with multiple plates of delicious appetizers. They also had a couple pasta options that I didn’t get to try. My food highlight in the Star Alliance Lounge was the little shot glasses filled with fudgy goodness! I thought it was pudding, but I was happily mistaken. I have no clue what it was, but it was DELICOUS! Drink Options: The Star Alliance lounge had the best drink options of any lounge. They have two bars. You can order a cocktail from a bar tender at one, or you go to the self-pour and do it your self. They have a huge liquor selection, and I believe their wine and champagne selection was also larger than any of the other lounges. WIFI: They give you a little sheet of paper with the password when you walk into the lounge. I easily connected and never had a problem. Showers: If you’re accessing the lounge with the Priority Pass (like I was). Then a shower will cost $20. No thanks! Hours: 7 a.m. to 2:30 a.m. Location: Right beside Starbucks, you’ll see a big twirling walkway that lead to the second floor. Go up the walkway, take a left, and keep walking until you run into the lounge. Access Options: There’s probably another way that I don’t know about, but I was able to access the lounge by using the Priority Pass combined with a same day boarding pass. Atmosphere: This lounge is nice, but it feels a little older than the other lounges in terminal 3. It was always dimly lit. With that said, it was the first lounge I visited and I ended up spending about 8 hours there before I knew there were other options. I like the fact that they had a stand up desk where I could work after a long flight. Also, if you’d like to take a nap, this is the place to go. They have big “U” shaped couches, and there were always people passed out. Food Options: It’s not that they didn’t have good food options in this lounge; they were just unimpressive compared to the other lounges. When I ate lunch here I had pasta with some kind of tomato cheese sauce. It was pretty good, but I really felt like it was my only good option. The sandwiches didn’t look very appetizing, and I was nervous to eat the salad. Drink Options: They have self-pour bar, but I was here early in the day and didn’t pay much attention. It’s kind of like the food, I’m sure it was fine. Other lounges just had more options. WIFI: The wifi was strong, and even if I turned off my computer it would automatically reconnect, which was nice! Showers: They told me it would be $15 if I wanted to shower. No Thanks! I’ll head to the LATAM Lounge. Again, the only reason I would spend time in one of these lounges (over a terminal 3 lounge), is if you need to spend the night in lounge. I’m not going to take the time to write about each section of this lounge. I had to spend one night sleeping in the airport, and this is where I slept. This lounge looks really old in comparison to the lounges in terminal 3. All of the chairs are exactly the same, which is just kind of weird. I don’t think I’ve ever seen that in a lounge before. The food and drink options were limited compared to the lounges in Terminal 3, and I didn’t test out the WIFI because I only stayed long enough to “sleep” for a few hours. However, if you have to visit a terminal 2 lounge, at least everything is free in this lounge unlike the other “VIP” lounge. In regards to sleep in the airport, this lounge was not the best! Since there are only chairs, your best bet is pull two of them together. To fit in the chairs, you have to assume the fetal position. You’d probably be better off sleeping at an empty gate on a long row of chairs. I decided to sleep in lounge because I felt like my bags were safer… Did I make the right call? Who knows? I’m just glad my night there is over! Honestly, I walked in this lounge just to say that I had been to every lounge in the airport. This lounge charges for drinks and shower. Why would you spend your time here when you have so many better options? If for some reason you really want to go, you can access this lounge with your priority pass. In summary, the LATAM lounge is by far the best lounge in the airport. If you can’t access the LATAM lounge, I would shoot for the Star Alliance Lounge or the American Airlines Lounge. Only go to the lounges in terminal 2 if you need 24 hr. access. I hope this post helps you make the most of your time in GRU. If you have specific questions about any of the lounges, just add them to the comments section below.